Just because the sun sets doesn’t mean the fun stops. In fact, it’s only just begun! When the sun goes down, Wheel Fun Rentals unleashes their night-time Surrey rides! Visitors and locals alike will be able to light up the Old Mill District with Wheel Fun Rentals’ signature cycles every Saturday night throughout the summer. 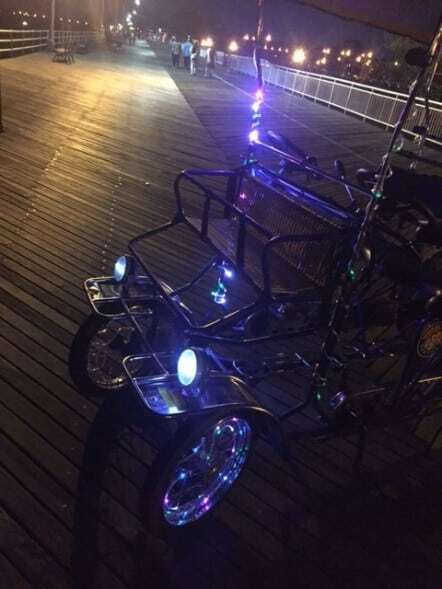 LED lights will be mounted on Single and Double Surreys making for an unforgettable night-time cycling experience! Night rides will be available every Saturday from July 21st through Labor Day weekend. The fun starts at sunset and goes until 10 p.m., with the last one-hour rental going out at 9:00pm, and last half-hour rental going out at 9:30pm. Rentals start at just $25 per hour and there are no reservations needed. Founded in 1987, Wheel Fun Rentals started with four wheel Surrey cycles, evolved into specialty bike rentals and bike tours, and now offers recreational rentals of all kinds from more than 100 outlets in 16 states. Specializing in unique bikes and tours, Wheel Fun Rentals has been offering clean, healthy family fun and affordable outdoor entertainment to more than 2.5 million customers annually from city and state parks, resorts, and retail outlets through corporate locations and franchised territories. For more information about Wheel Fun Rentals please visit www.wheelfunrentals.com or call 805-650-7770. Follow Wheel Fun Rentals: @WheelFunRentalsOfficial @WheelFunBend on Facebook, @WheelFunRentalsOfficial on Instagram, and @WheelFunRentals on Twitter.